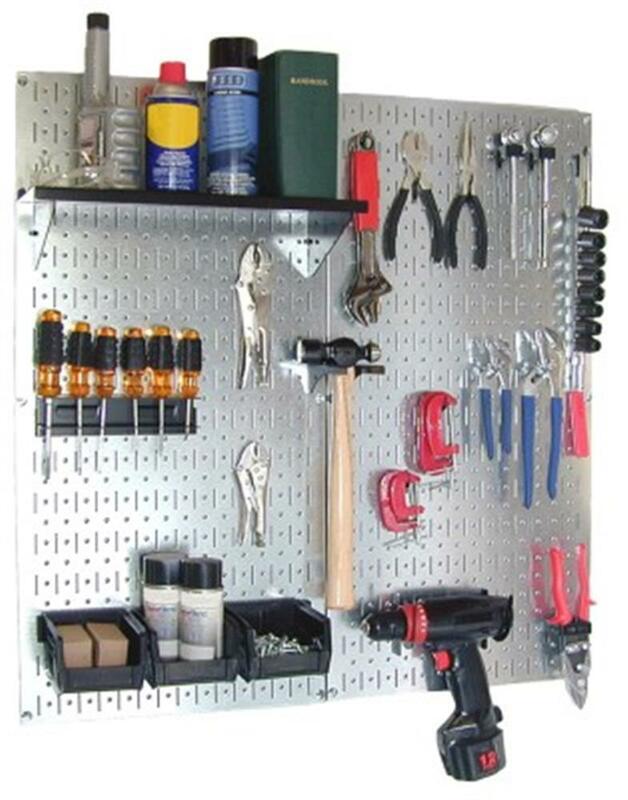 The Galvanized Steel Pegboard Utility Kit Organizer is an excellent addition to any work area. The wall-mounted galvanized steel pegboard panels are easy to install with pre-drilled mounting holes on 16-inch centers. A built-in frame flange provides ample hook clearance and full access to all holes without requiring additional framework. The patented double offset hook engagement improves hook stability for safer, more secure tool storage. The galvanized steel pegboard panels also accept traditional common 1/4-inch pegboard pegs. The kit includes two galvanized combo pegboard panels (which cover 32 inches by 32 inches), a 6-foot shelf assembly, three plastic bins with bin hanger, a screwdriver holder, a hammer holder, 15 assorted hooks and brackets, and mounting hardware and instructions. Mounting hardware is included. Made in USA.